Pearl's Ceramic Bonded Technology™ (CBT™) grain is a non-fused ceramic aluminum oxide that is extremely strong and durable. It is a very fine crystalline structure, which allows for micro-fracturing of the abrasive grain. This promotes constant generation of new cutting edges allowing for longer life and faster stock removal throughout the entire life of the wheel. In addition, CBT™ grains perform exceptionally well on stainless steel and are ideal for use when heat is a problem. 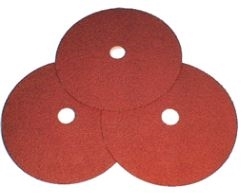 Pearl's Resin Fiber Discs with ceramic (CBT™) blend grains provide 2-3 times the performance of conventional aluminum oxide resin fiber discs. Grains remain sharp through entire life of the wheel - "self sharpening"